A valve-regulated lead-acid battery (VRLA battery) sometimes called sealed lead-acid (SLA) or maintenance free battery. There are three primary types of VRLA batteries, sealed VR wet cell, absorbent glass mat (AGM) and gel cell. Gel cells add silica dust to the electrolyte, forming a thick putty-like gel. These are sometimes referred to as "silicone batteries". AGM (absorbent glass mat) batteries feature fiberglass mesh between the battery plates which serves to contain the electrolyte. Both designs offer advantages and disadvantages compared to conventional batteries and sealed VR wet cells, as well as each other. Due to their construction, the gel cell and AGM types of VRLA can be mounted in any orientation, and do not require constant maintenance. The term "maintenance free" is a misnomer as VRLA batteries still require cleaning and regular functional testing. They are widely used in large portable electrical devices, off-grid power systems and similar roles, where large amounts of storage are needed at a lower cost than other low-maintenance technologies like lithium-ion. Lead-acid cells consist of two plates of lead, which serve as electrodes, suspended in an electrolyte consisting of diluted sulfuric acid. VRLA cells have the same chemistry. "Wet cell" type VRLA's contain acid in liquid form. In AGM and gel type VRLA's, the electrolyte is immobilized. In AGM this is accomplished with a fiberglass mat; in gel batteries or "gel cells", the electrolyte is in the form of a paste-like gel created by adding silica and other gelling agents to the electrolyte. When a cell discharges, the lead and diluted acid undergo a chemical reaction that produces lead sulfate and water. When a cell is subsequently charged, the lead sulfate and water are turned back into lead and acid. In all lead-acid battery designs, charging current must be adjusted to match the ability of the battery to absorb the energy. If the charging current is too great, electrolysis will occur, decomposing water into hydrogen and oxygen, in addition to the intended conversion of lead sulfate and water into lead dioxide, lead, and sulfuric acid (the reverse of the discharge process). If these gases are allowed to escape, as in a conventional flooded cell, the battery will need to have water (or electrolyte) added from time to time. In contrast, VRLA batteries retain generated gases within the battery as long as the pressure remains within safe levels. Under normal operating conditions the gases can then recombine within the battery itself, sometimes with the help of a catalyst, and no additional electrolyte is needed . However, if the pressure exceeds safety limits, safety valves open to allow the excess gases to escape, and in doing so regulate the pressure back to safe levels (hence "valve-regulated" in "VRLA"). In flooded lead-acid batteries, the liquid electrolyte is a hazard during shipping and makes them unsuitable for many portable applications. Furthermore, the need to maintain water levels in non-sealed batteries makes them unsuitable for maintenance-free applications. The immobilized electrolyte in VRLA batteries (AGM and gel types) addresses these problems. Conversely, VRLA cells can't be replenished with water, and any hydrogen lost can't easily be replaced. To some extent, this can be compensated for by over-provisioning the quantity of electrolyte, at the cost of increased weight. But the main disadvantage of the VRLA design is that the immobilizing agent also impedes the chemical reactions that generate current. For this reason, VRLAs have lower peak power ratings than conventional designs. This makes them less useful for roles like car engine starting batteries where usage patterns are brief high-current pulses (during starting) followed by long slow recharging cycles. VRLA's are mostly found in roles where the charge/recharge cycles are slower, such as power storage applications. Both flooded and VRLA designs require suitable ventilation around the batteries; both to prevent hydrogen concentrations from building up (hydrogen gas is highly flammable), and to ensure that the batteries receive adequate cooling. VRLA cells may be made of flat plates similar to a conventional flooded lead–acid battery, or may be made in a spiral roll form to make cylindrical cells. VRLA batteries have a pressure relief valve which will activate when the battery starts building pressure of hydrogen gas, generally a result of being recharged. Valve activation allows some of the gas or electrolyte to escape, thus decreasing the overall capacity of the battery. Rectangular cells may have valves set to operate as low as 1 or 2 psi; round spiral cells, with metal external containers, can have valves set as high as 40 psi. The cell covers typically have gas diffusers built into them that allow safe dispersal of any excess hydrogen that may be formed during overcharge. They are not permanently sealed, but are designated to be "maintenance free". They can be oriented in any manner, unlike normal lead–acid batteries, which must be kept upright to avoid acid spills and to keep the plates' orientation vertical. Cells may be operated with the plates horizontal (pancake style), which may improve cycle life. At high overcharge currents, electrolysis of water occurs, expelling hydrogen and oxygen gas through the battery's valves. Care must be taken to prevent short circuits and rapid charging. Constant-voltage charging is the usual, most efficient and fastest charging method for VRLA batteries, although other methods can be used. VRLA batteries may be continually "float" charged at around 2.35 volts per cell at 25 °C. Some designs can be fast charged (1 hour) at high rates. Sustained charging at 2.7 V per cell will damage the cells. Constant-current overcharging at high rates (rates faster than restoring the rated capacity in three hours) will exceed the capacity of the cell to recombine hydrogen and oxygen. The first lead-acid gel battery was invented by Elektrotechnische Fabrik Sonneberg in 1934. The modern gel or VRLA battery was invented by Otto Jache of Sonnenschein in 1957. The first AGM cell was the Cyclon, patented by Gates Rubber Corporation in 1972 and now produced by EnerSys. The cyclon is a spiral-wound cell with thin lead foil electrodes. A number of manufacturers seized on the technology to implement it in cells with conventional flat plates. 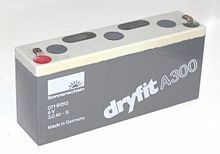 In the mid-1980s two UK companies, Chloride and Tungstone, simultaneously introduced 10 year life AGM batteries in capacities up to 400 Ah, stimulated by a British Telecom specification for batteries for support of new digital exchanges. In the same period, Gates acquired another UK company, Varley, specialising in aircraft and military batteries. Varley adapted the Cyclon lead foil technology to produce flat plate batteries with exceptional high rate output. These gained approval for a variety of aircraft including the BAe 125 and 146 business jets, the Harrier and its derivative the AV8B, and some F16 variants as the first alternatives to the normal nickel-cadmium (NiCd) batteries. Moves to higher capacity AGM batteries were led by GNB's Absolyte range extending to 3900 Ah. VRLA/AGM technology is now widespread in both stationary and vehicle batteries. AGM batteries differ from flooded lead acid batteries in that the electrolyte is held in the glass mats, as opposed to freely flooding the plates. Very thin glass fibers are woven into a mat to increase surface area enough to hold sufficient electrolyte on the cells for their lifetime. The fibers that compose the fine glass mat do not absorb nor are they affected by the acidic electrolyte. These mats are wrung out 2–5% after being soaked in acids, prior to manufacture completion and sealing. The plates in an AGM battery may be any shape. Some are flat, others are bent or rolled. AGM batteries, both deep cycle and starting, are built in a rectangular case to Battery Council International (BCI) battery code specifications. AGM batteries present better self discharging characteristics than conventional batteries in different range of temperatures. As with lead-acid batteries to maximize the life of AGM battery is important to follow charging specifications and a voltage regulated charger is recommended. and also there is a correlation between the depth of discharge (DOD) and the Cycle life of the battery, with differences between 500 and 1300 cycles depending on depth of discharge. Originally a kind of gel cell was produced in the early 1930s for portable valve (tube) radio LT supply (2, 4 or 6V) by adding silica to the sulfuric acid. By this time the glass case was being replaced by celluloid and later in 1930s other plastics. Earlier "wet" cells in glass jars used special valves to allow tilt from vertical to one horizontal direction in 1927 to 1931 or 1932. The gel cells were less likely to leak when the portable set was handled roughly. 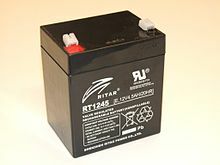 A modern gel battery (also known as a "gel cell") is a VRLA battery with a gelified electrolyte; the sulfuric acid is mixed with fumed silica, which makes the resulting mass gel-like and immobile. Unlike a flooded wet-cell lead-acid battery, these batteries do not need to be kept upright. Gel batteries reduce the electrolyte evaporation, spillage (and subsequent corrosion problems) common to the wet-cell battery, and boast greater resistance to shock and vibration. Chemically they are almost the same as wet (non-sealed) batteries except that the antimony in the lead plates is replaced by calcium, and gas recombination can take place. The modern gel formulation and large scale production was from Otto Jache's and Heinz Schroeder's U.S. Patent 4,414,302 assigned to the German company Accumulatorenfabrik Sonnenschein GmbH. With gel electrolyte the separator was no longer such a critical, hard-to-make component, and cycle life was increased, in some cases dramatically. Shedding of active material from the plates was reduced. More importantly, gas recombination was used to make batteries that were not "watered" and could be called maintenance-free. The one-way valves were set at 2 psi, and this was high enough for full recombination to take place. At the end of charge when oxygen was evolved from overcharge on the positive plate, it traveled through the shrinkage cracks in the gel directly to the negative plate (made from high surface area pure sponge lead) and "burned" up as fast as it was made. This oxygen gas and the hydrogen adsorbed on the surface of the sponge lead metal negative plate combined to make water that was retained in the cell. This sealed, non-spill feature made it possible to make very small VRLA batteries (1 –12 Amp hr. range) that fit into the growing portable electronics market. A large market for inexpensive smaller sealed lead acid batteries was generated quickly. Portable TV, light for news cameras, children's toy riding cars, emergency lighting, and UPS systems for computer back-up, to name a few, were powered with small sealed VRLA batteries. Many modern motorcycles and All-terrain vehicles (ATVs) on the market use AGM batteries to reduce likelihood of acid spilling during cornering, vibration, or after accidents, and for packaging reasons. The lighter, smaller battery can be installed at an odd angle if needed for the design of the motorcycle. Due to the higher manufacturing costs compared with flooded lead–acid batteries, AGM batteries are currently used on luxury vehicles. As vehicles become heavier and equipped with more electronic devices such as navigation and stability control, AGM batteries are being employed to lower vehicle weight and provide better electrical reliability compared with flooded lead–acid batteries. 5 series BMWs from March 2007 incorporate AGM batteries in conjunction with devices for recovering brake energy using regenerative braking and computer control to ensure the alternator charges the battery when the car is decelerating. Vehicles used in auto racing may use AGM batteries due to their vibration resistance. Deep-cycle AGMs are also commonly used in off grid solar power and wind power installations as an energy storage bank and in large-scale amateur robotics, such as the FIRST and IGVC competitions. AGM batteries are routinely chosen for remote sensors such as ice monitoring stations in the Arctic. AGM batteries, due to their lack of free electrolyte, will not crack and leak in these cold environments. VRLA batteries are used extensively in power wheelchairs, as the extremely low gas and acid output makes them much safer for indoor use. VRLA batteries are also used in the uninterruptible power supply (UPS) as a back up when the electrical power goes off. VRLA batteries are also the standard power source in sailplanes, due to their ability to withstand a variety of flight attitudes and a relatively large ambient temperature range with no adverse effects. However, charging regimes must be adapted with varying temperature. Both AGM and Gel cells are commonly used in powered aerobatic aircraft, for the same reasons. VRLA batteries are used in the US Nuclear Submarine fleet, due to their power density, elimination of gassing, reduced maintenance, and enhanced safety. AGM and Gel-cell batteries are also used for recreational marine purposes, with AGM being more commonly available. AGM deep-cycle marine batteries are offered by a number of suppliers. They typically are favored for their low maintenance and spill-proof quality, although generally considered a less cost effective solution relative to traditional flooded cells. In telecommunications applications, VRLA batteries that comply with criteria in Telcordia Technologies requirements document GR-4228, Valve-Regulated Lead-Acid (VRLA) Battery String Certification Levels Based on Requirements for Safety and Performance, are recommended for deployment in the Outside Plant (OSP) at locations such as Controlled Environmental Vaults (CEVs), Electronic Equipment Enclosures (EEEs), and huts, and in uncontrolled structures such as cabinets. Relative to VRLA in telecommunications, the use of VRLA Ohmic Measurement Type Equipment (OMTE) and OMTE-like measurement equipment is a fairly new process to evaluate telecommunications battery plants. The proper use of ohmic test equipment allows battery testing without the need to remove batteries from service to perform costly and time-consuming discharge tests. VRLA Gel and AGM batteries offer several advantages compared with VRLA flooded lead acid and conventional lead–acid batteries. The battery can be mounted in any position, since the valves only operate on over-pressure faults. Since the battery system is designed to be recombinant and eliminate the emission of gases on overcharge, room ventilation requirements are reduced, and no acid fume is emitted during normal operation. Flooded cell gas emissions are of little consequence in all but the smallest confined areas, and pose very little threat to a domestic user, so a wet cell battery designed for longevity gives lower costs per kWh. In a gel battery, the volume of free electrolyte that could be released on damage to the case or venting is very small. There is no need (or ability) to check the level of electrolyte or to top up water lost due to electrolysis, reducing inspection and maintenance requirements. Wet cell batteries can be maintained by a self-watering system or by topping up every three months. The requirement to add distilled water is normally caused by overcharging. A well-regulated system should not require top-up more often than every three months. The underlying fault with all lead acid batteries is the requirement for an excessively long charge time arising from a two-stage process: bulk charge and float charge. All lead acid batteries, irrespective of type, are quick to charge to 70% of capacity within 2 or 3 hours, but require another 9 to 10 hours to "float charge" after the initial charge. If users fail to float charge, battery capacity is dramatically reduced. To ensure maximum life, a lead acid battery should be kept at full charge when stored (or stored dry), and, when working, kept at depth of discharge of less than 20%. In addition, its discharge rate should be not more than three hours and its charge rate should be not more than three hours (C0.333), and it should be float charged properly. With less careful use, a lifetime as few as 500 cycles might be expected, dependent upon the use environment. Because of calcium added to its plates to reduce water loss, a sealed AGM or gel battery recharges more quickly than a flooded lead acid battery of either VRLA or conventional design. "From a standard car, 4WD or truck alternator they will recharge quickly from full use in about 2 to 3 hours. A deep cycle wet cell battery can take 8-12 hours to achieve only 70% to 80% of its potential charge." Compared to flooded batteries, VRLA batteries are more vulnerable to thermal runaway during abusive charging. The electrolyte cannot be tested by hydrometer to diagnose improper charging that can reduce battery life. AGM automobile batteries are typically about twice the price of flooded-cell batteries in a given Battery Council International (BCI) size group; gel batteries as much as five times the price. Have shorter recharge time than flooded lead-acid. Cannot tolerate overcharging: overcharging leads to premature failure. Have shorter useful life, compared to properly maintained wet-cell battery. Discharge significantly less hydrogen gas. AGM batteries are by nature, safer for the environment, and safer to use. Can be used or positioned in any orientation. The storage of electrical energy. By Gaston Planté. Storage Batteries: Their Theory, Construction and Use. By Arthur Eugene Watson. Bubier Publishing Company, 1911. John McGavack. The Absorption of Sulfur Dioxide by the Gel of Silicic Acid. Eschenbach Print. Company, 1920. U.S. Patent 3,271,199 Solid Acid Storage Battery Electrolyte. Alexander Koenig et al. ^ "AGM Battery Guide - Pros & Cons of AGM Batteries - Canbat Batteries". Canbat.ca. 2016-05-02. Retrieved 2017-06-17. ^ "Lead Acid Batteries - Environmental Health and Safety" (PDF). Canada: Concordia University. p. 13. Retrieved 2018-11-26. ^ Wagner, R (2004-03-09). "13.3 Gel batteries". In Moseley, Patrick T; et al. (eds.). Valve-Regulated Lead-Acid Batteries. p. 446. ISBN 9780444507464. ^ "A Brief History of Batteries and Stored Energy" (PDF). Netaworld.org. Retrieved 19 February 2019. ^ "Handbook for Gel-VRLA-Batteries : Part 1 : Basic Principles, Design, Features" (PDF). Sonnenschein.org. Retrieved 19 February 2019. ^ John Devitt (1997). "An account of the development of the first valve-regulated lead/acid cell". Journal of Power Sources. 64 (1–2): 153–156. Bibcode:1997JPS....64..153D. doi:10.1016/S0378-7753(96)02516-5. ^ "AGM Charging : Technical Support Desk". Support.rollsbattery.com. Retrieved 19 February 2019. ^ "AGM Discharge Characteristics : Modified on: Mon, 6 Oct, 2014". Support.rollsbattery.com. Retrieved 19 February 2019. ^ Watterson, Michael (2014-06-28). "Exide Gel-Cel Accumulator JSK2 Power-S Chloride Electrical". Radiomuseum.org. Retrieved 2015-03-01. ^ Walchhofer, Hans Martin & Watterson, Michael (2013-11-27). "Super Range Portable (without tuning dial) Radio McMichael L". Radiomuseum.org. Retrieved 2015-03-01. ^ "Exide Earns First-Ever Production Contract Awarded by U.S. Navy for Valve-Regulated Submarine Batteries; Shift to Advanced Product Prompts Closure of Kankakee, Illinois, Battery Plant". Business Wire. 2005. Retrieved 7 September 2016. ^ "GR-4228 - Valve-Regulated Lead-Acid (VRLA) - Telcordia". Telecom-info.telcordia.com. Retrieved 19 February 2019. ^ GR-3169-CORE, Generic Requirements for Valve-Regulated Lead-Acid (VRLA) Battery Ohmic Measurement Type Equipment (OMTE). ^ a b c d Calder, Nigel (1996). Boatowner's Mechanical and Electrical Manual (2nd ed.). p. 11. ISBN 978-0-07-009618-9.